In a place like Washington DC, when people think of power and politics, they think of the President, Congress, CEOs, or lobbying chiefs, but Mikva Challenge DC is on a mission to reshape that perception. Mikva DC exists to enhance the expertise and power of young people to create change, and to inform both local and national policy making. 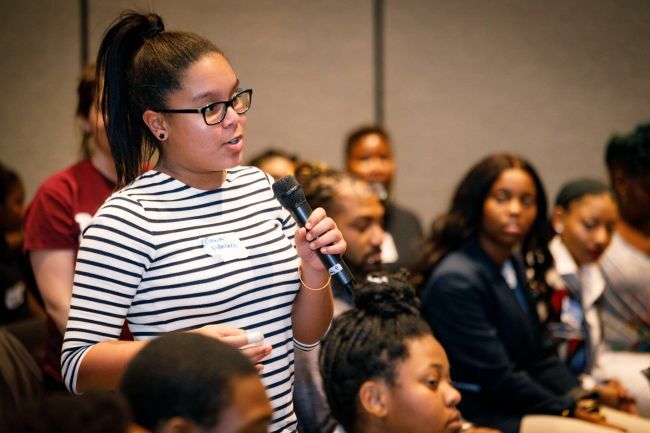 Modeled after the successful civic engagement programming developed for youth in Chicago, Mikva Challenge DC develops youth to be empowered, informed, and active citizens who will promote a just and equitable society. 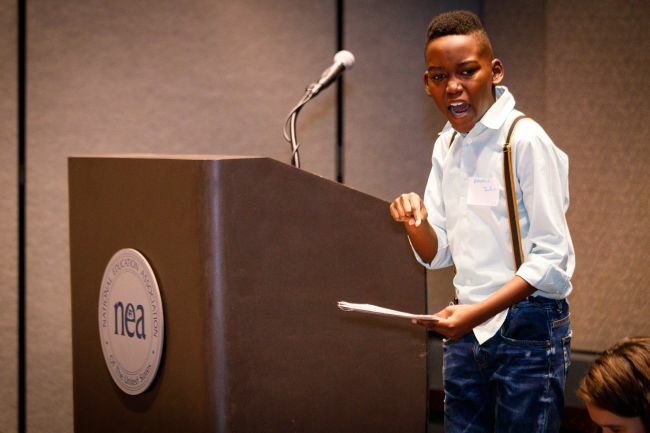 One way Mikva DC students ‘do civics’ is by speaking out on how to address issues in their communities via an annual citywide speech competition called Project Soapbox. This past December, students took to the stage to speak about a range of deeply important topics, like mental health support, LGBTQ discrimination, racism & xenophobia, food deserts, and homelessness. Mikva Challenge DC’s credo is that young people who do civics will help make the nation become its very best democratic self. And who can argue against that when you hear, see, and experience the vision and power of DC youth for yourself? Conversations around “Collective Impact” and “Nonprofit Collaboration” continue to gain traction as more and more funders and nonprofits see the progress that happens when organizations gather together to leverage their collective resources, networks, and knowledge. At the Catalogue, we hear countless examples of our nonprofits joining together to collaborate, innovate, and accomplish big goals. And since we believe in the power of nonprofits to spark big change, we want to help them leverage the power of collaboration as much as possible. Beginning in April, the Catalogue for Philanthropy will be debuting several new features on our website to promote nonprofit collaboration. 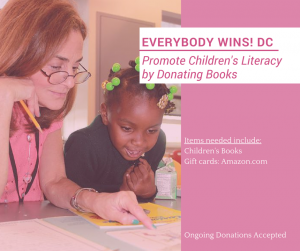 Our Collaborative Campaigns encourage the Catalogues network of 350+ charities to use their collective impact to tackle important issues in Greater Washington. 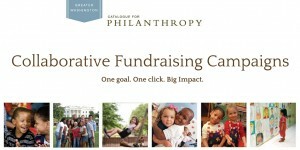 With a common, clear goal in mind, two or more Catalogue nonprofits can fundraise together to achieve that goal. When a donor makes a gift to the campaign, funds are split evenly across the participating organizations. 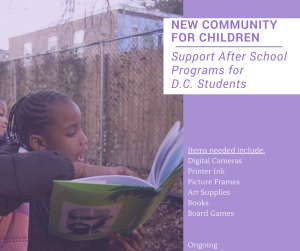 We’re excited to debut our Collaborative Campaigns this Thursday, April 7th with Girls on the Run councils of Greater Washington (DC, Montgomery County, and Northern Virginia). You can preview their campaign for healthy & strong girls here. Our Collaboration Corner blog posts will feature perspectives from two or more nonprofits that give readers an inside look at the collaborative process. From learning how the organizations came together, to what issue(s) they’re trying to tackle, any benefits/challenges along the way, and how the public can get involved in supporting their efforts, this blog not only serves to inform our community, but also nonprofits looking to glean “lessons learned” in the process of collaboration. We’re excited to debut these features in April, and hope you’ll support those organizations collaborating with one another to create a greater, Greater Washington. Want to get involved with a fundraiser, or submit a blog post? Contact us at info@cfp-dc.org. 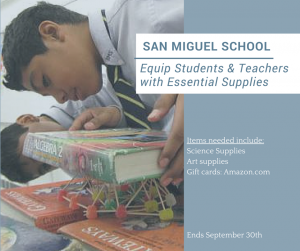 Want to give back before “back-to-school”? We’ve got you covered. 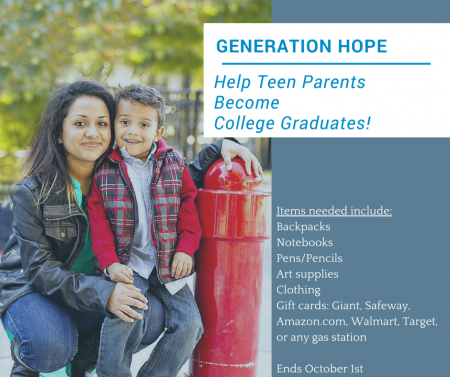 Looking for a way to help local students and their families kick off the school year on the right foot? 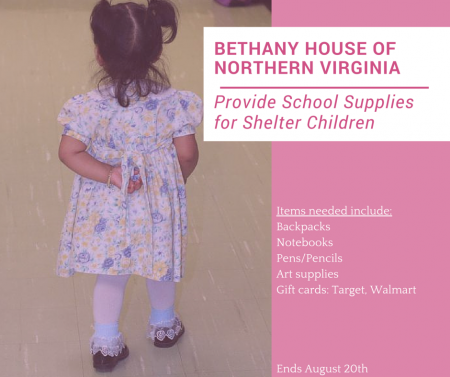 Consider supporting one of the back-to-school supply drives from the following Catalogue for Philanthropy charities (click the image to visit the supply drive homepage — and please, don’t forget to tell the charity that you found it through the Catalogue!). Last night, Catalogue President Barbara Harman joined other leaders in the DC nonprofit community to celebrate the work of Julie Rogers, President and CEO of the Eugene and Agnes E. Meyer Foundation, who will be stepping down from her position after 28 years of leadership. The event, held at the Carnegie Institution for Science, included performances and tributes from grantees (such as 2013-2014 Catalogue charity DC Scores), past and present board members, and staff. “I met many people in the assembled group who talked about the impact that a Meyer grant had had on their organization: Meyer’s stamp of approval was critical in their growth. We can say the same at the Catalogue: Meyer gave us our VERY FIRST grant and has been a loyal funder and partner since the Catalogue began in 2003.?Meyer trusted us, even when we were new guys in town, and their support grew over the years. Best wishes to Julie Rogers from the entire Catalogue for Philanthropy team! On Tuesday, May 6th,the Catalogue’s Marketing Communications Workshop Series culminated with a session focused on brand-building for nonprofits. The series, sponsored by Integrity Management Consulting, was designed to help nonprofits strengthen their storytelling and value propositions through their writing, imagery, and branding. Aline Newman, Director of Marketing and Communications at the Catalogue for Philanthropy, presented this session to 40 Catalogue nonprofit attendees. The discussion focused on understanding what a brand is, why branding is important for nonprofits, how it differs from corporate branding, and how nonprofits can use their brand to accelerate their mission. 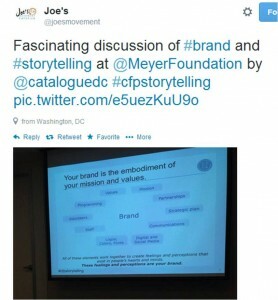 Attendees shared their takeaways from the event on social media with the hashtag #cfpstorytelling. It spite of resistance to branding among some in the nonprofit sector (some fear that it is too “corporate” or distracts from activities such as fundraising and program management), the truth is that a brand is one of the most valuable assets in any nonprofit organization. When rooted firmly in an organization’s mission and values, a brand has potential to unite staff, donors and volunteers, as well as attract partners who are best suited to broaden overall impact. During the workshop, attendees explored the initial steps needed to build a strong brand. A strong brand is not built primarily on logos, colors, or websites, but instead on a thorough understanding of internal identity and external image, and aligning these to establish a sense of trust. Following the presentation was a lively Q&A and brainstorming session in which nonprofits shared their challenges — and insights — with one another based on recent experiences. Due to the large amount of interest in the topic of branding, the Catalogue is exploring the possibility of developing a new series of workshops devoted to the many areas of this topic. Stay tuned! At the Catalogue for Philanthropy, one of our main goals is to increase the capacity of each of the 350+ charities in our network. This spring — thanks to generous support from Integrity Management Consulting — the Catalogue is hosting our first-ever series of workshops on Nonprofit Marketing Communications. The series kicked off in early April with Barbara Harman’s workshop, “Telling Your Story,” in which she shared with attendees how to adapt their organizational stories for a variety of audiences and uses. Barbara’s experience as Executive Director of the Harman Family Foundation, as well as her experience as a published author and English professor, gave nonprofits unique perspectives on writing grant applications, thanking donors, communicating with corporate sponsors, and talking about impact. She encouraged nonprofits to speak in a human language (i.e. avoid sector jargon), find organizing themes when describing programs, and empower their readers through engagement. Our 2nd workshop in the series, “Communicating via Imagery” showed attendees how to take their stories to the next level. The Catalogue for Philanthropy and the Meyer Foundation hosted Leigh Vogel- a press and nonprofit photographer (and a longtime Catalogue friend) to share how to integrate imagery into communications plans. The workshop explored how to create an image strategy that that enhances an organization’s storytelling, and included practical, actionable advice for nonprofits about an overview of the kinds of photos they need, how to collect and organize them, and what to do with them both on- and offline. Leigh even gave attendees the opportunity to shoot photos during the workshop using two of her professional cameras! Stay tuned for a roundup of the Catalogue’s 3rd and final workshop in this series on May 6th, when Aline Newman, Director of Marketing and Communications for the Catalogue for Philanthropy, will work with attendees on how to identify and share their “brand story” in order to motivate donors, staff, volunteers, beneficiaries and partners. 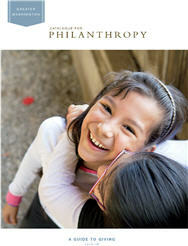 Catalogue nonprofits are staying busy! If you are looking for something fun to do with your friends and family this upcoming week, try one of these events put on by some great Catalogue nonprofits! MCA is partnering with Potomac Pedalers for the 5th annual MoCo Farm Tour. Bikers can choose from winding farm routes of 17-75 miles through Montgomery County’s Ag Reserve. There is also a picnic for bikers and event volunteers at Kingsbury’s Orchard. Volunteer Info: Help set up the picnic for bikers- shuttle biker’s belongings back to their cars, engage with event attendees about the purpose and importance of the Ag Reserve. Service learning hours are available for MCPS students. Register now to Join Boston Marathon runners and a local Junior Olympiad recordholder for the Teddy Bear 5K and 1K Walk/Run on the W&OD Trail starting in the heart of Falls Church, VA. All participants will receive T-Shirts and great prizes will be awarded the top three male and female runners in 8 age categories, plus best overall male, female and Stroller-Runner. Bring your Teddy Bear or favorite stuffed friend to be admitted to a tea party after the race. Online Registration thru Sept. 26 at www.safetyandhealthfoundation.org/TeddyBear. 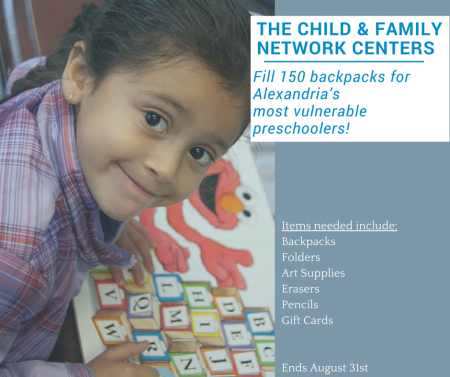 Proceeds benefit the Falls Church-McLean Children’s Center, a high-quality early childhood education program serving all children, regardless of their family’s financial resources. Fee? yes 5K thru Sept. 26, $30; 1K thru Sept. 26, $15. Volunteer Info: Volunteers welcome to assist along the trail, giving out water to runners. Volunteer Opportunity at the Ronald McDonald Family Room at Children’s National Medical Center Ronald McDonald House Charities (RMHC) of Greater Washington DC needs volunteers to work a weekly 3 hour shift in the Ronald McDonald Family Room located at Children’s National Medical Center (CNMC). Shifts are seven days a week: 9AM to Noon, Noon to 3PM, 3PM to 6PM and 6PM to 9PM. Volunteers will be cross trained by both RMHC and CNMC. A commitment of two shifts a month/60 hours a year is required. 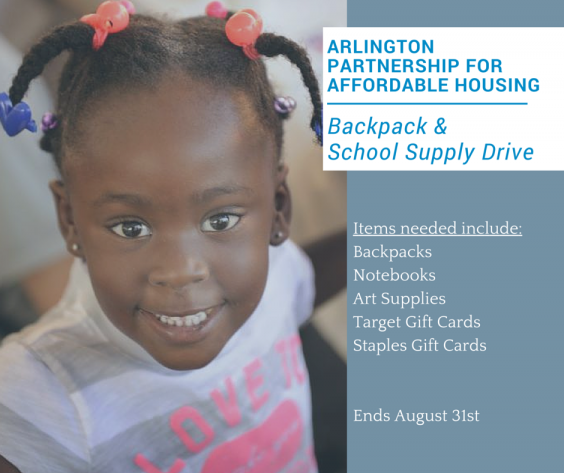 Contact: Karen Judson, 202-529-8204/kjudson@rmhcdc.org. www.rmhc.greaterdc.org. Volunteer Info: Greeting and helping families, coordinate family programming activities and more.